The Nissan is equipped with the complete Power Enterprise Twin Turbo Kit, including exhaust manifolds, front mount intercooler etc. Engine internals left completely stock! The car was tested by the DTC and is 100% streetlegal. In this test we were running on 0.4 bar boost only. Power, response and driveability with this setup are amazing! Hello, I would like to program my car with Uprev. It’s a Nissan 350z, engine VQ35HR. The car has filters air K&N, tubes air special Z1 Motorsport, worked plenum Z1 motorsport, air collector Z1 Motorsport. In exhausst, he has cats kinetix + line Invidia Gemini. On your site, I found a price of 1’150.-, is it with Dyno before + later? do you use uprev for 350z ecu tuning ? With the odb2 port ? Can we have 2 or 3 maps and switch with the cruse control ? 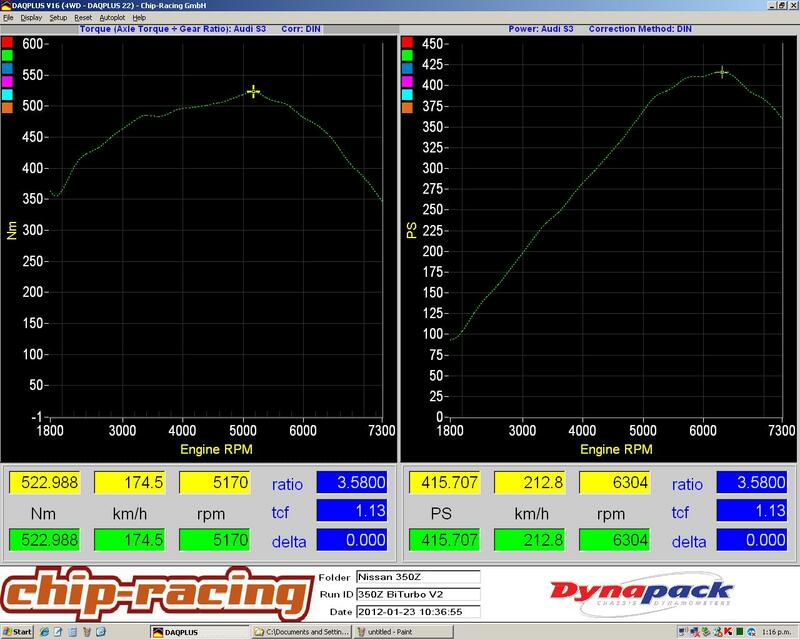 How many time takes for ecu tunig in dyno ? We can do the tuning with UpRev via OBD port. Yes, we can have more then 1 map on some ECU’s and switch it via cruise control. Usually we take the car for one day for a dyno tune. hi, the kit is still available, how much it cost? No, i’m afraid the Power Enterprises kit is discontinued. But we can deliver the AAM EFR Kit as well.